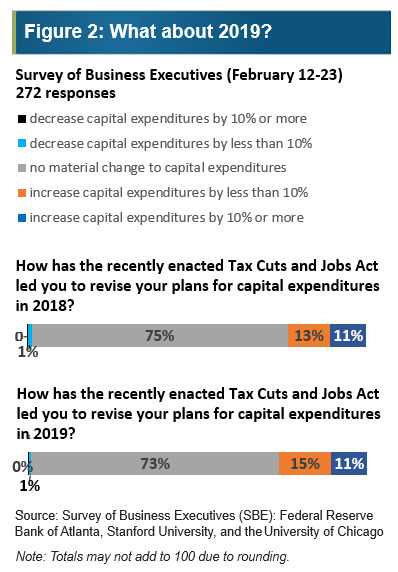 New tax cuts are unlikely to spur business investment to any large extent, according to a new survey conducted by the Atlanta Fed in conjuction with academics. 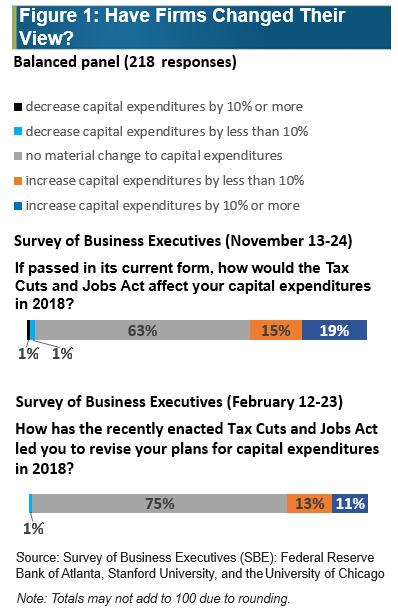 The survey shows some three-quarters of executives had made no spending plans at all in response to the passage of the tax cuts. “We’re sticking with our initial assessment that the potential for a sharp acceleration in near-term output growth is limited,” Atlanta Fed economists write. Republicans’ pitch on tax cuts was fairly clear: Lower rates on corporations would spur investment and create new jobs. A new survey published by the Federal Reserve Bank of Atlanta in conjunction with Stanford University and University of Chicago Booth School economists shows the new policy measures have done little do bolster corporate investment plans. The chart below speaks for itself – some three-quarters of executives reported no changes in investment plans at all. Looking further out into 2019, the results were even more lacklustre. “It is still the case that the typical (or median) large firm has not revised its 2019 capex plans in response to tax changes,” Atlanta Fed economists write in their macroblog. 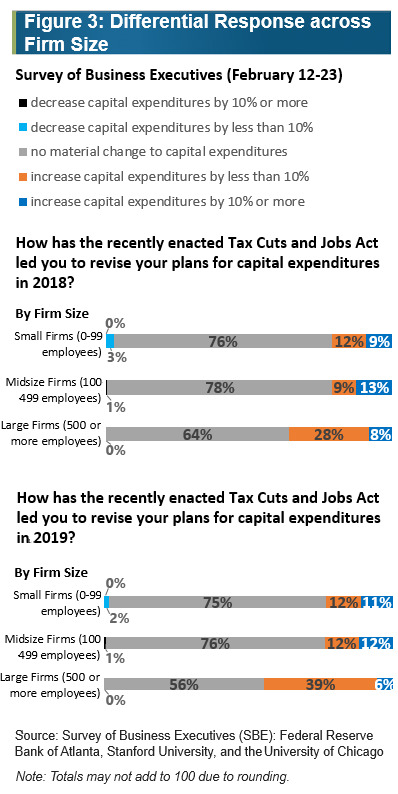 Despite politicians’ pledges to help small businesses, “it seems that larger firms (those with more than 500 employees) responded more favourably to the tax reform. But it is still the case that the typical (or median) large firm has not revised its 2019 capex plans in response to tax changes,” the Atlanta Fed economists wrote.